Curious’ strong visual and design elements and exceptional character work combine to produce realtime storytelling that audiences become part of. With style and humour Curious wrap their enchanting tales around people dissolving the line between audience and performer. Curious’ costumes vary from princess’s to halloween characters to fit in with any event. ★ Dissolving the line between audience and performer. Glamorous and naughty these two lead anyone astray. Our two angels are serene and graceful but also partial to dancing to almost any kind of music which they consider to be the greatest of the gifts of the gods. She is tall, elegant and commands attention. A true queen. These girls love to PARTY! Whether a 70’s theme or just a funky event our Disco Dollies will ‘do the do’ and ‘shake their thangs’ and bring buckets of party vibes. 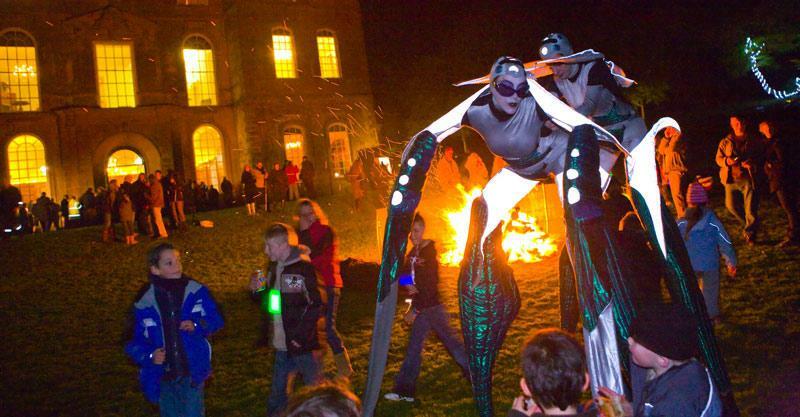 Our two robots are both on four-legged stilts and are powerful and imposing creations. They look fantastic at the entrance to an event or prowling around a reception. They are equally at home performing on stage with a Techno band. 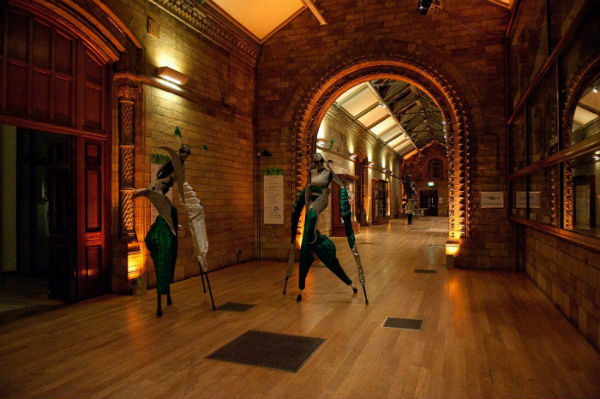 On Dura stilts, this is our first human statue on stilts. She stands at 9 feet tall and combines traditional statue performance with interactive walkabout and looks fantastic on the dance floor! The techno Angel was designed for a party in Ibiza and so is quite a funky creature. Her wings are covered in blue LED lights that flash in time with the music. She is definitely rather a bad influence! Our two clowns are probably our most colourful characters. They have a naive and playful sense of humour and help to lighten the tone and break the ice. 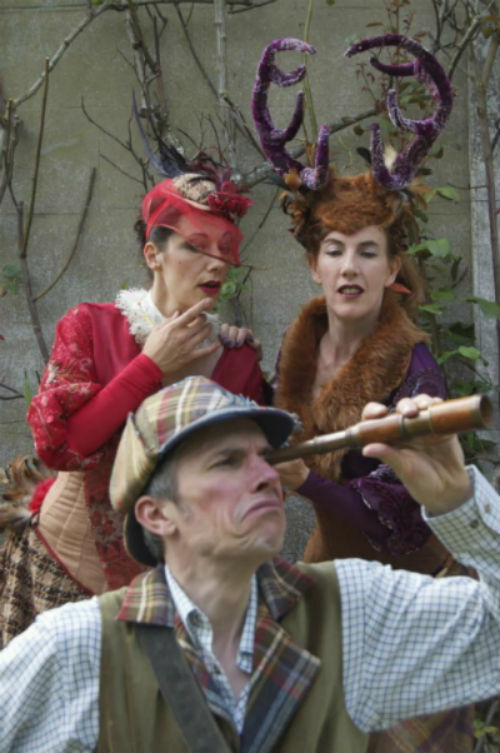 This is a walkabout show about dreams based loosely on Roald Dahl’s The BFG. At a party the characters with their feathers and corsets add glamour and colour with a feeling of the Venice Carnival. If appropriate they can offer guests a hand mixed dream which involves a little ‘hocus pocus’ with some glitter dust. The street theatre version is more structured and texted and the dream-making process culminates in a dance set to music. This is a whole family of six stilt characters and two on foot. The costumes are all white and silver and fit well into themes such as Futuristic or Winter Wonderland and are often described as being in the style of Cirque du Soleil. 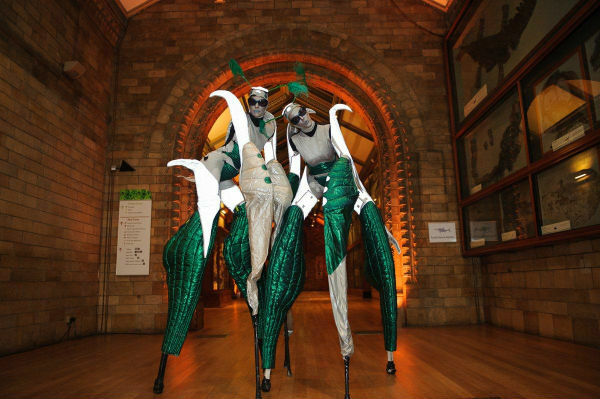 The two performers on foot are acrobats and offer a 5 minute acrobalance set to music. Any number of the lumen family may be booked. 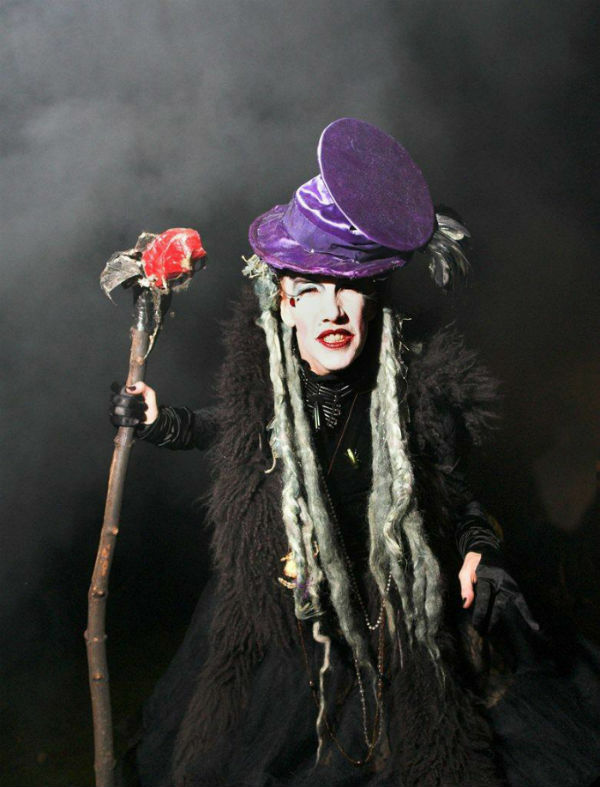 Not necessarily evil, this rather glamorous witch carries special effects including coloured smoke and will turn your guests into the handsome princes and princesses that they truly are. She also doubles as The Nightmare character with the Dreamcatchers. A full set of characters from Wonderland with our own stylish and contemporary twists. These guys all work for the same firm of money people and each one comes from one of the four different international offices- London, Amsterdam, Texas and Tel Aviv. When outside they perform synchronised routines with their umbrellas, introduce themselves to everyone, scout for business and shout into their mobiles. These three lovely ladies bring colour, glamour and gossip. 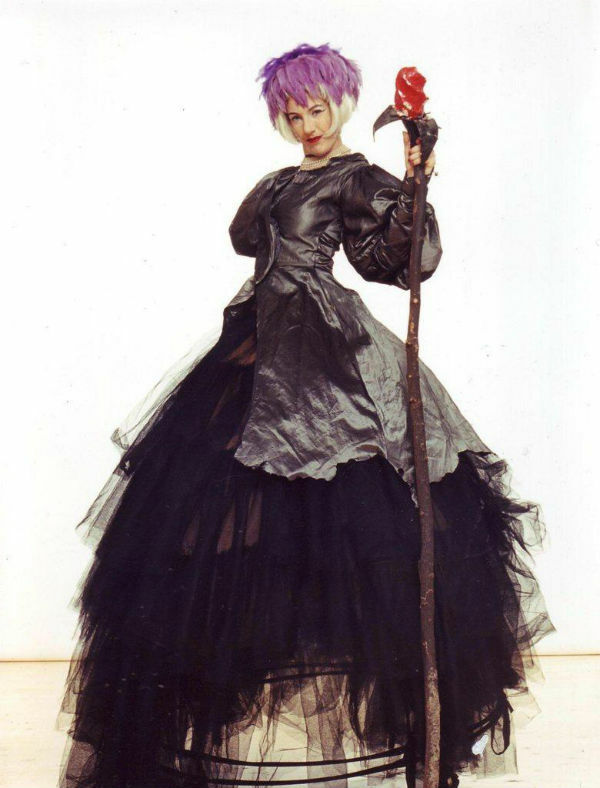 All on stilts they come with or without big crinoline hoops in their skirts depending on how much space you have. These characters are also part of the Dreamcatchers. For years we have been playing 5-a-side on stilts as training for confidence and fitness and finally we have made outfits to perform in. Whether just as totally accessible walkabout characters or especially for a sporting event or with the full ten performers playing a match these characters do what it says on the packet- they play football. Designed as Millennium Bugs for New Years Eve 1999 at the Dome they have been corrupting software wherever they go ever since. The Colours are all about shape, colour and movement. 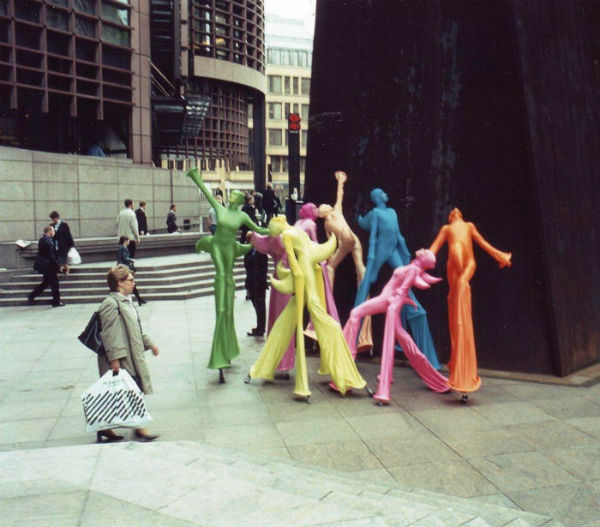 They are living sculptures, they are contemporary dance and they are fun. They have worked well in many different environments from art fairs to raves. There are about ten of them in total but they keep multiplying and they are different shapes and sizes mostly but not all on stilts. Two are on foot and can be on trapezes or do acrobatics. This walkabout piece can involve 2-4 of the characters who perform totally original acrobatic moves and balances that can be highly animated or still if necessary. They have been described as a combination of couture and sculpture. Often silent, they work as well in close quarters as indoor entertainment or from a distance outside. For a sporty theme why not have our super tall basketball player and the lovely Miss Hoop. An interactive walkabout, audience members are encouraged to shoot a hoop. Luckily the hoop is generally on their side and is an excellent catch! “Little Miss Texas” has never been overseas before so is understandably perplexed at the way things are done over here. She misses her horse and is looking for suitable cowboy to keep her company. Jack Frost and the Ice Queen bring with them the glamorous side of winter. Perfect for winter parties, their characters combine the regal with the impish and are well suited to ‘meet and greet’. Our two snow people are furry and funny and loved by everyone. The only problem with them is they melt if they get too hot! The Tulip Queen and accompanying Fool create a synergy of theatricality and 18th century inspired etiquette. These two fabulous outfits work well with clients who prefer entertainment that does not demand too much from their guests, something elegant to look at that will lift the room effortlessly in the grand manner. Lord Bunting has got his eye on two cracking fillies. One looks rather like a Stag, sporting horns and so on, and the other reminds him of a Pheasant. All the more reason to give chase! 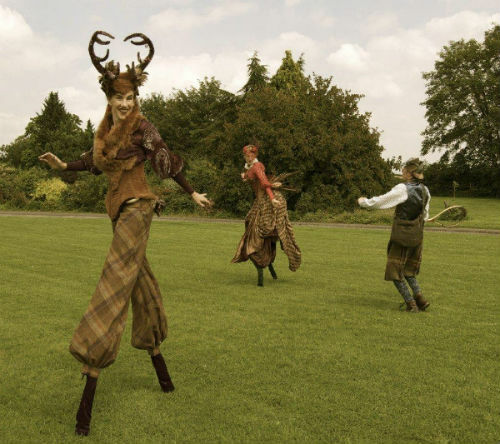 This thoroughly British 3 handed walkabout brings an haute couture twist to the more traditional side of our country sports.